Many churches already have boards with lists of past incumbents, which are a useful starting point for thinking about their role in the history of a parish. If such a board does not exist, memorial and commemorative tablets around the church may also help you to piece some of the sequence together. Are there any surviving photographs of them around the church? – these can give clues to their churchmanship as well as their personalities. Even if some of the names mean nothing as yet, a list still starts to raise interesting questions. Were long incumbencies (of say more than 20 years) periods of stability and growth or of stagnation and decline? Conversely do short incumbencies point to dynamic positive change or to crisis and lack of direction? For better or worse, incumbents (especially those with lengthy tenures) have usually exercised a profound influence on the history of their parishes, and it is well worth seeking to find out more about such key individuals. In particular founding incumbents of new parishes are likely to have established assumptions and patterns of ministry that lasted long after their own time. What can people tell you about previous incumbents? Are there traditions relating to long dead incumbents who had a lasting impact on the church? How does the present incumbent see him/herself in relation to their predecessors? Follow this link for information on oral history. Some clergy in poorer urban areas worked in difficult circumstances. 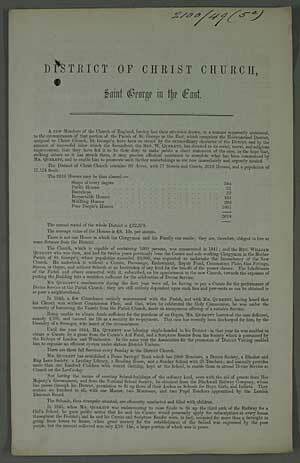 This funds appeal for the Christ Church district of St George in the East describes an incumbent, Rev. 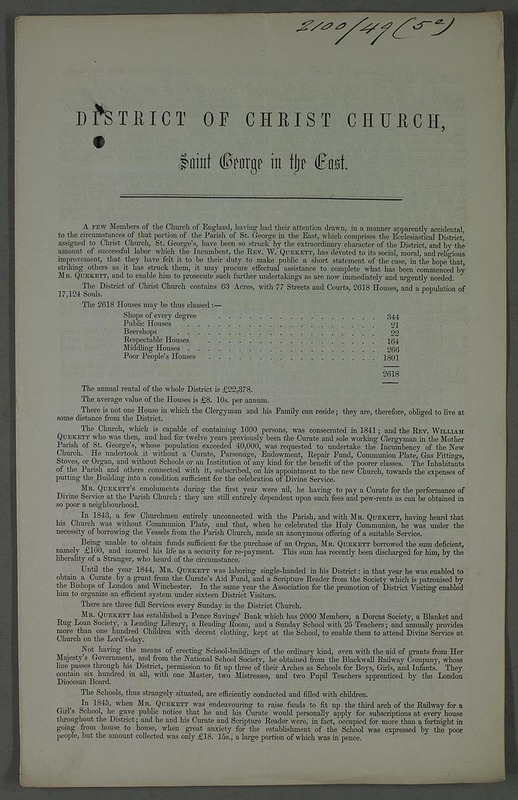 W. Quekett, who had served a parish of 40,000 ‘without a Curate, Parsonage, Endowment, Repair Fund, Communion Plate, Gas Fittings, Stoves, or Organ…’ (Image courtesy of the Trustees of Lambeth Palace Library). Alan Haig, The Victorian Clergy, London: Croom Helm, 1984. Peter C. Hammond, The Parson and the Victorian Parish, London: Hodder and Stoughton, 1977. Brian Heeney, A Different Kind of Gentleman: Parish Clergy as Professional Men in Mid-Victorian England, Archon, 1976. W.M. 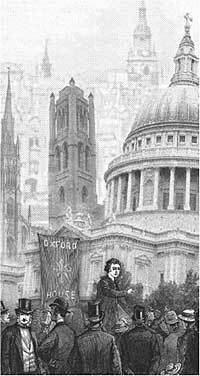 Jacob, The Clerical Profession in the Long Eighteenth Century 1680-1840, Oxford: Oxford University Press, 2007. For information on past clergy with brief biographical details, the best starting point is Crockfords Clerical Directory [see p. 2 of our expanded How to Research a London Clergyman guide], which was first published in 1858. Copies are available at Lambeth Palace Library, or online via www.ancestry.co.uk. For earlier periods you can use The Clerical Guide [see p. 2 of our expanded How to Research a London Clergyman guide], or The Clergy List, or, up to 1835 [see p. 2 of our expanded How to Research a London Clergyman guide], the online Clergy of the Church of England Database, although you should note that this is still a work in progress as far as the Diocese of London is concerned. Assistant curates may well be harder to identify and document than incumbents, and usually only had a more passing influence. They may still in some cases have played historically significant roles, for example in pioneering a daughter church or a distinctive sphere of ministry. However in the earlier nineteenth century and earlier curates may well have been deputizing for an absentee, incapacitated or pluralist incumbent and therefore remained in post for extended periods and shaped the development of a parish. For more information on the numerous sources for research on a London clergyman see our expanded pdf guide.